The good news: we loved vegan Glasgow. The bad? We had to leave. The Ugly: mushy peas. Eating vegan in Glasgow takes two forms: bars with music venues or cafes. We personally loved this and feel they characterize Glasgow’s food scene in particular. In this vegan guide to Glasgow you’ll find a healthy dose of pubs but also cafes, restaurants, and other spots to grab a quick bite while touring Glasgow’s sights. Not only is there quite a few all vegan restaurants in Glasgow, food services seem to generally offer vegetarian, usually with some vegan options. Supermarkets carry specifically vegan products, with aisles marketed toward special diets called “Free From.” There are even some local British brands that make vegetarian and vegan products. And there’s the Scottish brand Sheese for cheese. Even the ferry to Arran Isle had vegetarian options with vegan products. Could a cool vegan spot get any more convenient? Just a block away from the main city train station, Glasgow Central, yet tucked away in an alley like side street that’s easy for tourists to miss. We had just arrived, full travel gear in tow, after wading through London and a beautiful train ride. Stereo felt like an oasis from the UK bustle. The menu was overwhelming in options, but later we would learn that a lot of these are staples. Mediterranean plates, falafels, sandwiches, mac and cheese, and burgers, seem to be at every spot. We opted to share the special, creamy sauce gnocchi with black pudding (blood sausage veganized) and a plate of mac and cheese The portions are generous, both delicious and the chips (fries for us muricans) are fresh cut and one of our favorite things in Glasgow. Also, we love the half pint option, as we’re still used to the very Spanish sized caña . The same guy who owns Stereo also owns Mono (and the 78 and the Flying Duck), so while the each place has a unique vibe and menu, they all have two things in common: vegan food and a performance space. Unlike Stereo, Mono also has a record store. Could a vegan foodie spot get any cooler? Mono is less centrally located than Stereo but still downtown. Fortunately, we love walking. We shared a large house-brewed ginger brew. It was delicious and snappy, with some real ginger punch. As for grubs, we’d been impatiently waiting for a vegan take on fish and chips. Theirs did not disappoint. The To-Fish had nice seafood-y taste via a nori stickered on the tofu, battered and fried just like we remembered. The only room for improvement would be true fish analog, but then again, some people don’t want their vegan meats to bear any resemblance to animal flesh. The server recommended a side of mushy peas, as it’s a “very British thing.” Veren found them a bit lacking in flavor – too sour – and he loves vinegar. The chips however, were excellent like Stereo’s. The housemade tartar sauce was the best we’ve ever had. The seitan burger was good, but the patty felt a bit small and too fried for our burger tastes. The record store was very cool, and we found some interestingly obscure albums (maybe only obscure to us amateur music lovers). This is the pubbiest of all the spots we visited when “researching” for this vegan guide to Glasgow. A “proper” pub, as our British friends would say. Indoors is very woody, even with a hearth and couches. Lots of ale on tap, and it seems they have an even bigger selection of bottled beer. We went for more cider, as we just love alcoholic apple juice. We shared a homemade veggie burger and quesadilla, which came with hand cut chips (think more like wedges than Mono and Stereo’s fresh but mechanically cut chips), and soup of the day. The quesadilla was very good, but there was room for improvement. The soup was hearty for the weather. Chips were excellent. The burger’s excellence requires an explanation. We draw a spectrum for vegan burgers. One end is the vegetabled patty, which isn’t trying to be meaty, as opposed the other end, a meat analog. We don’t prefer one over the other, but we find them equally challenging and satisfying when done properly. This was the first homemade burger that fits right in the middle of the spectrum. A combo of textured proteins and veggie chunks, and just the right amount of juicy and crumbly, we talked with our mouths full about already coming back. They even have daily specials that include unique takes on burgers, with ingredients like coconut. (For examples of the best meat analog burger, read about The Vurger in Valencia. For an example of the best veggie burger, see Viva Burger in our vegan lunch guide in Madrid). This cozy local cafe was the only place to get two visits from us in two weeks – and that’s saying a lot as we normally like to eat out at a new place each time. We loved Soy Division so much we wrote its own separate profile. Read it here! The Sparknotes version of our Soy Division review is this: sausage rolls, impeccable pastry crust, the best quiche we’ve ever had, and fudgie wudgies. Debbie is the creator and cook at Soy Division. A more warm-hearted and lovely woman you’d be hard-pressed to find! Make sure you strike up a chat with her after you’ve devoured a sampling of her home cooked Scottish food. If we commuted daily to Merchant City, this would be a solid lunch spot. Picnic has lots of breakfast and lunch favorites like bagels and sandwiches with homemade fillings and spreads. It’d be hard to go wrong here. We eat every vegan croissant we find and theirs looked delicious. Not sure if it’s housemade, but it looked better than it tasted. Maybe we’re just spoiled by the insanely flaky vegan croissants from Passion Flour Patisserie when we were house sitting in Salt Lake City or the Goodie’s croissant we had in Berlin. Even Mercadona, a Spanish food chain we patronize in Madrid, has a solid multi-grain one. So we’re experienced and pretentious on the croissant front. Picnic’s full Scottish breakfast was a much more healthy take on the plate, with most items being steamed or boiled, like the spinach and sliced beet, respectively. With lots of smoothie and salad options, this place is geared for the health conscious frequent eater outer. The stand out for us was the no egg salad sandwich – rich and creamy – a vegan first for us and an absolute treat. Ridiculously cheap two-course lunch special from 12 – 2 pm. Lotus is just over the bridge south of downtown and serves delicious authentic Chinese food. They offer veggie plates as well as mock meats. So if you’re in the mood for some non-British fare, get to steppin’. See our profile for the whole story. The biggest and most spacious of all places, probably due to its basement location. Long tables connected from smaller ones linked together denizens and provided a generally lively food hall affair. The kitchen stays open later than most, with DJs and other live music as well later in the night. We were a bit disappointed with the food, unfortunately. Sandwiches came with “salad” or what I’d call a toddler’s fistful of leaves, and a side of coleslaw (which had excellent homemade vegan mayo though). The chili dog just didn’t have enough chili and few shreds of cheese. The dog itself had less flavor than unseasoned tofu. Nothing like the bratwurst they said it was. Sam’s tempeh rashers were not like tempeh at all, but more like deli meat slices – which isn’t a bad thing, just misleading. Also, the “pretzel” rolls looked the part but felt like stale bread. Chips are extra, and they’re not even fresh cut, so we skipped on that. The menu proudly denounced other mock mayonnaise with their homemade one, and I wish they held all their other food to the same standards. Ultimately, come here for the ambiance and the – OMG I’m out and it’s a party – feeling. Apparently, The 13th Note was named the Best Chips in Glasgow several years in a row. Unfortunately, we found the chips to be quite a disappointment – we had far better chips at Stereo and Mono. These were undercooked and we could not taste any rosemary despite the “Rosemary Chips” name. Sigh. The sausage roll was also misleading, as it’s not the pastry dough rolled sausage, but just sliced sausages on a hamburger bun with butter. Not bad for a cheap quick eat, but nothing special. And we suspect these are the same Linda McCartney veg sausages that you can buy in a supermarket for a couple pounds. Hardly feels like they’re trying. Otherwise, a very cool ambiance with a solid draught selection. While it’s unlikely you’ll find yourself this far east unless you’re house sitting there or have a friend to visit, there are a couple spots worth checking out in Denniston – this and Kind Crusts. We actually ended up here because Kind Crusts was closed, despite saying it was open online and no notice on their Facebook page. Tapa has excellent coffee, possibly the best cup we had in Glasgow. It’s a vegetarian bakery (but that’s essentially what most bakeries are), with some cafe items. Lots of bread to be had for sure. We had a slice of vegan apple cake and the frosting was cream cheesy amazing. The Sam would’ve given it a perfect score except it had raisins. We saved this decadent dessert for the end. A warm brownie with vanilla ice cream – get it at The 78. We used our friend Lisa aka Vegan Nomad Chick’s great Vegan Guide to Scotland not only in Glasgow but in Edinburgh. Read our guide on things to do in Glasgow. 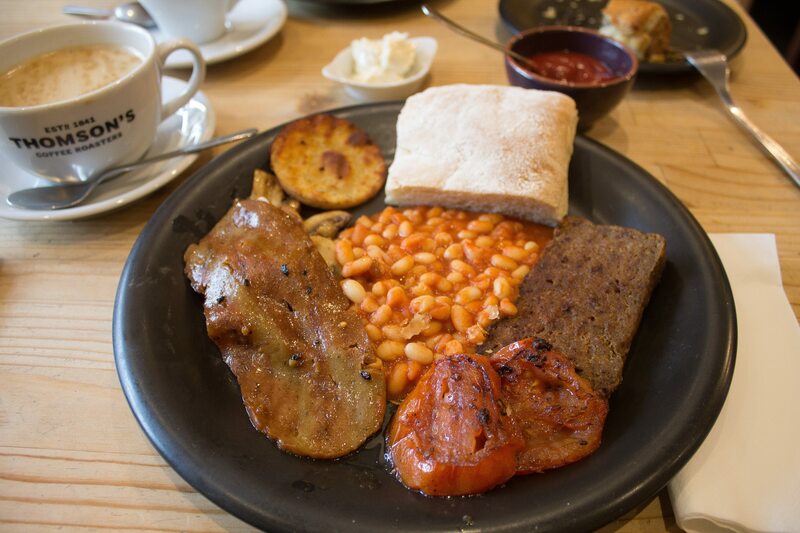 Indefinite Adventure also has a vegan guide to Glasgow with their take on some of the above spots and some others we didn’t try. PETA has a pretty epic Glasgow vegan guide with lots of vegan places but also vegetarian and veg-friendly spots. Pin Vegan Guide to Glasgow!